Acting on the policy of the Carter Doctrine, and out of fear the Iraqi army could launch an invasion of Saudi Arabia, U.S. President George H. W. Bush quickly announced that the U.S. would launch a "wholly defensive" mission to prevent Iraq from invading Saudi Arabia – Operation Desert Shield was when U.S. troops were moved into Saudi Arabia on August 7, 1990 (or August 8 depending on time zone used). This "wholly defensive" doctrine was to be quickly abandoned. On August 8, Iraq declared parts of Kuwait to be extensions of the Iraqi province of Basra and the rest to be the 19th province of Iraq. The US Navy mobilized two naval battle groups, the aircraft carriers USS Dwight D. Eisenhower and USS Independence and their escorts, to the area, where they were ready by August 8. 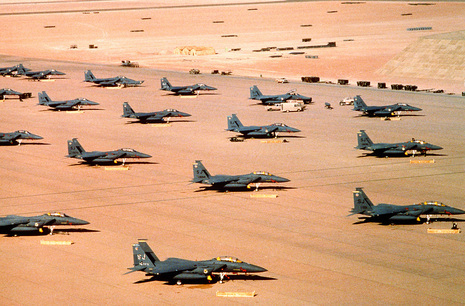 A total of 48 U.S. Air Force F-15s from the 1st Fighter Wing at Langley Air Force Base, Virginia, landed in Saudi Arabia and immediately commenced round the clock air patrols of the Saudi–Kuwait–Iraq border areas to discourage further Iraqi advances. 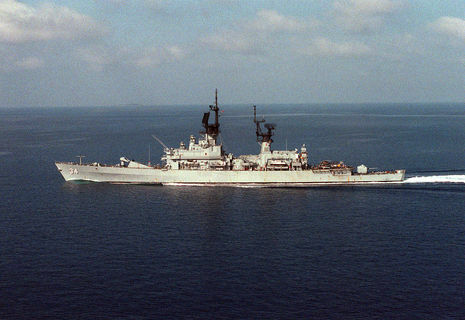 The U.S. also sent the battleships USS Missouri and USS Wisconsin to the region. Military buildup continued from there, eventually reaching 543,000 troops, twice the number used in the 2003 invasion of Iraq. Much of the material was airlifted or carried to the staging areas via fast sealift ships, allowing a quick buildup. In 1990, fellow Arab Gulf states refused to endorse Iraqi leader Saddam Hussein's plan to cut production and raise the price of oil, leaving him frustrated and paranoid. Iraq had incurred a mountain of debt during its war with Iran that had lasted for most of the previous decade, and the Iraqi President felt that his Arab brothers were conspiring against him by refusing to raise oil prices. 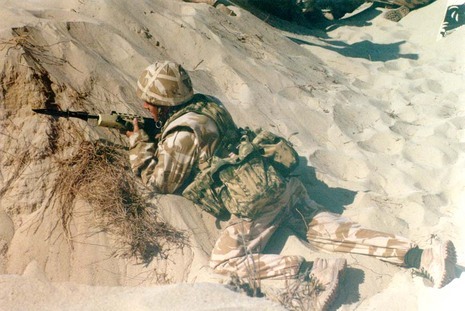 Therefore, after weeks of massing troops along the Iraq-Kuwait border and accusing Kuwait of various crimes, Hussein sent seven divisions of the Iraqi Army into Kuwait in the early morning hours of 2 August 1990. The invasion force of 120,000 troops and 2,000 tanks quickly overwhelmed Iraq's neighbor to the south, allowing Hussein to declare, in less than a week, that Kuwait was his nation's nineteenth province. The United Nations responded quickly, passing a series of resolutions that condemned the invasion, called for an immediate withdrawal of Iraqi troops from Kuwait, imposed a financial and trade embargo on Iraq, and declared the annexation void. Regarding Iraq's actions as a threat to a vital interest of the US, namely the oil production capability of the Persian Gulf region, President George Bush ordered warplanes and ground forces to Saudi Arabia after obtaining King Fahd's approval. 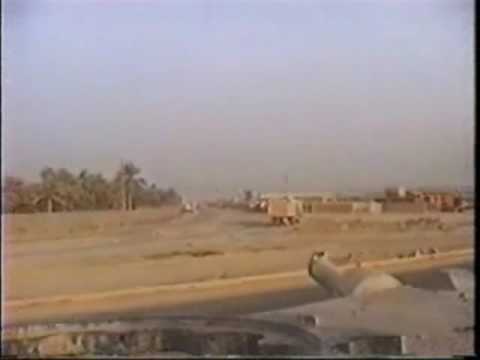 Iraqi troops had begun to mass along the Saudi border, breaching it at some points, and indicating the possibility that Hussein's forces would continue south into Saudi Arabia's oil fields. Operation DESERT SHIELD, the US military deployment to first defend Saudi Arabia grew rapidly to become the largest American deployment since the Southeast Asia Conflict. The Gulf region was within US Central Command's (CENTCOM) area of responsibility. Eventually, 30 nations joined the military coalition arrayed against Iraq, with a further 18 countries supplying economic, humanitarian, or other type of assistance.